Doors won't open for more than a year, but rooms at the Hyatt Regency Portland are already in demand. 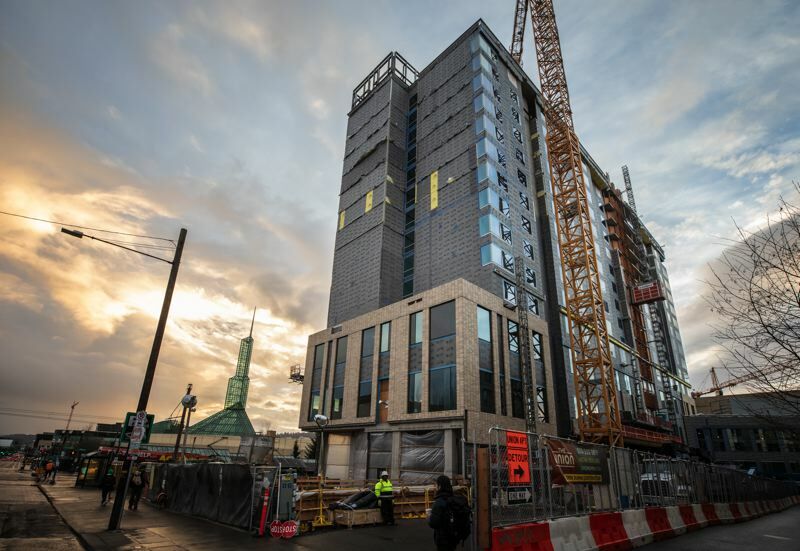 Even though the Hyatt Regency Portland hotel near the Oregon Convention Center is a work in progress, the project already is already attracting attention in Portland — and beyond. 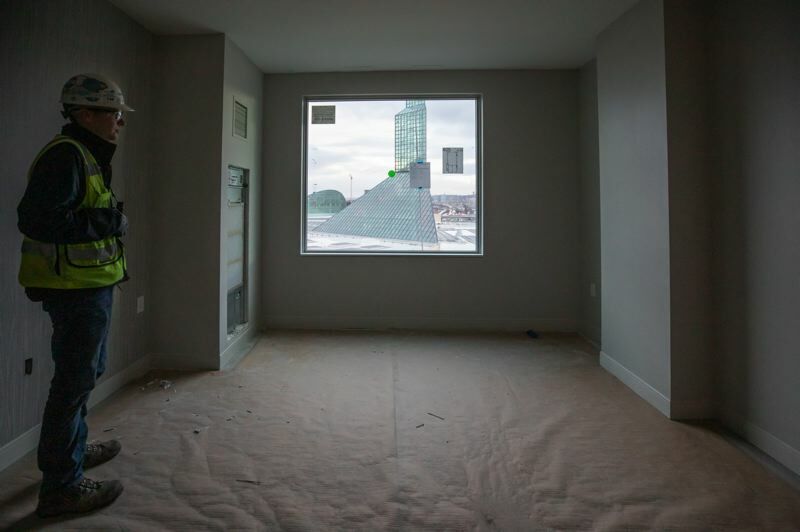 Inside the 14-story project, some of the 600 guest rooms are taking shape. A grand ballroom, while still relatively bare, provides a sense of the size of the space. Meanwhile, in a restaurant kitchen area, shiny surfaces are evident. There were times when many thought the convention center hotel would never happen. Even as the project began moving forward after years of discussion and debate, a group of hotel owners filed a lawsuit, claiming a decision by Metro regional government to use lodging taxes to subsidize construction of the hotel should be referred to voters. The issue was headed for the Oregon Supreme Court, when Metro and the group in 2016 agreed in a settlement to drop all lawsuits, clearing the path for construction of the Hyatt Regency Portland to begin in 2017. The hotel isn't slated to open until February 2020. But many say it's already having a local impact, from helping efforts to build a much-needed skilled construction workforce to the promise of boosting tourism dollars spent in the city. 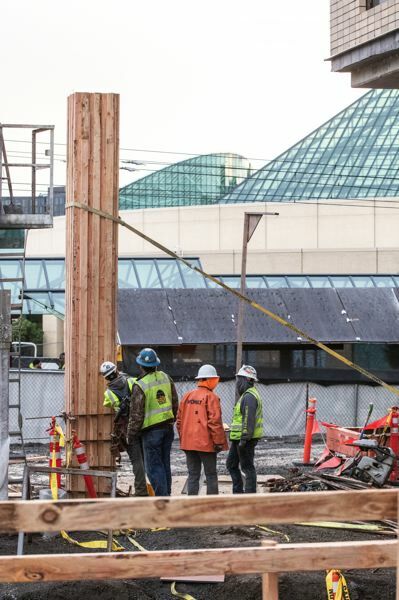 While construction companies working on Portland projects have learned that tight footprints with little room to lay down materials come with the turf these days, the Hyatt Regency site is an especially tight fit. The Union Apartments sit immediately to the north. To the west, there's a new parking garage rising. Martin Luther King Jr. Boulevard, a busy main street, runs along the east side. And to the south of the project, where the main entrance to the hotel will be placed, lies a popular light-rail platform that provides rider access to red, blue and green line trains. The lack of on-site space has been one of the main challenges that project leaders with Mortenson, serving as the hotel developer and contractor, say they've faced. With 40 to 50 subcontractors and as many as 275 workers on site at a time, Mortenson's project team has turned to technology to keep the workflow organized and on track. The team uses a smartphone app to schedule tower crane and fork lift times as well as delivery logistics. Project team members and subcontractors can request to schedule equipment time via the app and team leaders can check to make sure there are no bottlenecks with a couple of screen swipes. "It just comes down to trying to fine tune all those schedules and logistics and get everybody to stick to the plan," Dan Sizemore, senior superintendent for Mortenson, said. "We start to veer off plan, that's when we have our hardest days." The project team and its partners also have found a way around the limited-space conundrum by using pre-fabrication, a process by which components are built off-site and then trucked to the project and set in place. The exterior wall panels, for example, were assembled at a remote location before being moved to the hotel site for installation. "While we were going up on the structure, they were able to build all those panels off-site during the week," Sizemore said. "Then on the weekend, we could come in on Saturday and set up almost half of a floor." In addition to being faster, prefabrication is also safer and more efficient, according to Sizemore and Mortenson senior project manager Pat Clemons. Components can be built in a controlled environment, which helps improve quality control. In addition, much of the work can be done on workbenches or other set-ups that limit how much time subcontractor crews have to spend on their knees or contorting into small spaces. "It's efficient for production," Clemons said. "It's ergonomically better." "Even if you had all the room in the world, there's still so much advantage to being able to do that work early and do it in a nice, safe, quality-controlled environment," Sizemore added. Coming in a close second in the world of challenges on the $224 million hotel project is another industry-wide headache: finding enough skilled workers. 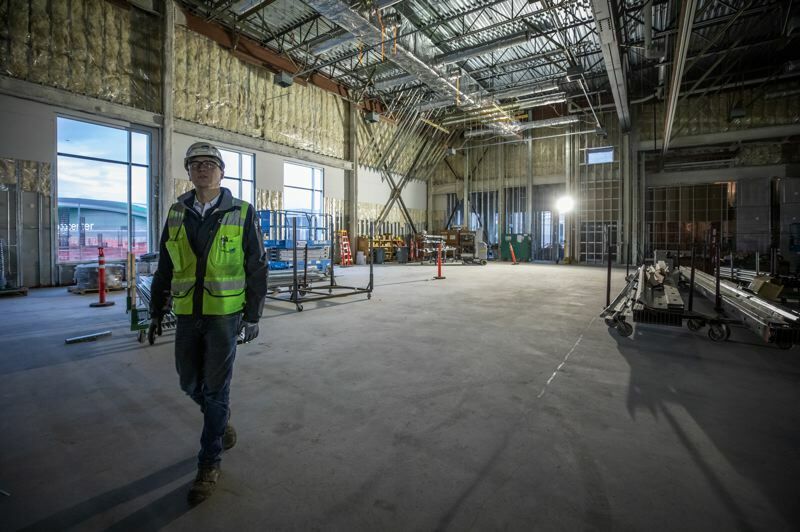 With an eye toward helping to grow the industry's local workforce, the hotel project came with expectations for the number of apprentices to be employed on the project as well as the numbers of minority and women in the total workforce. Both Metro and Mortenson agreed to 20 percent apprenticeship participation, a goal that has been exceeded by 5 percent, according to recent numbers presented by Mortenson. In fact, several apprentices have been able to obtain enough hours on the project that they've qualified for status as journeymen, Sizemore said. Goals for total workforce representation have been more of a challenge. The number of minorities represented in the total workforce is at 29 percent, just 1 percent behind goal. Women, however, are coming in at 9 percent representation, which is below the 15 percent goal for that group. In order to continue to strive toward the workforce goals, Mortenson has focused on providing opportunities for pre-apprentices, with 33 of those positions already supported through the project and more planned as work moves forward. In addition, companies looking to work on the project were expected to provide details about their plans to provide opportunities for apprentices while also promoting and supporting diversity. For Doug Beens, the hotel project is giving him a chance to build a foundation for a future career as a carpenter. 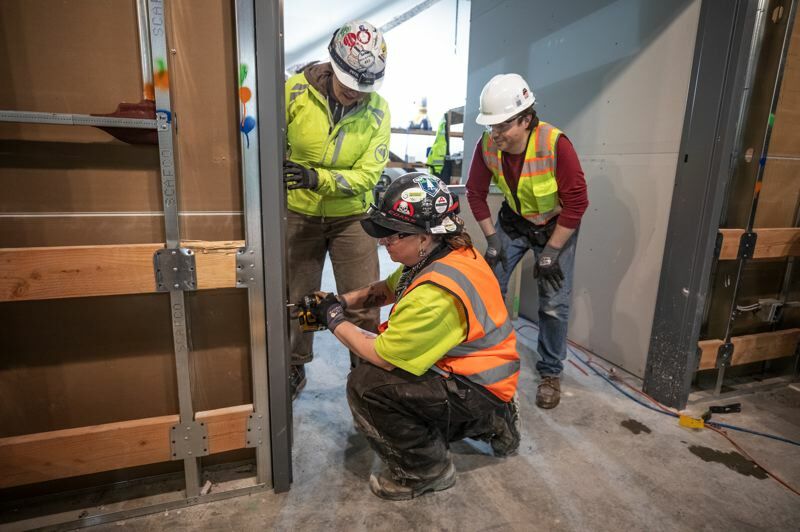 During his fourth day both on the job and as an apprentice with Local 1503, Beens kept busy helping journeyman carpenters Khara Carlson and Shannel Robinson hang a door on the first floor of the hotel project. Beens says the opportunity to work on the hotel project has convinced him that he's chosen the right career. "I love it," he said. "I've already learned a lot." Hyatt isn't waiting for the hotel's doors to open to begin building a contingent of employees. The hotel already has a director of sales and marketing on the payroll and hired its first sales manager about a month ago. Once it's fully operational, the hotel is expected to create as many as 950 new hospitality jobs in Portland. "They'll be spending the next 12 months staffing up," Cindy Wallace, who serves as sales director for the Oregon Convention Center, said. Wallace and her team, along with Travel Portland as a marketing partner, have been busy spreading the word and building future business for both the convention center and the hotel. 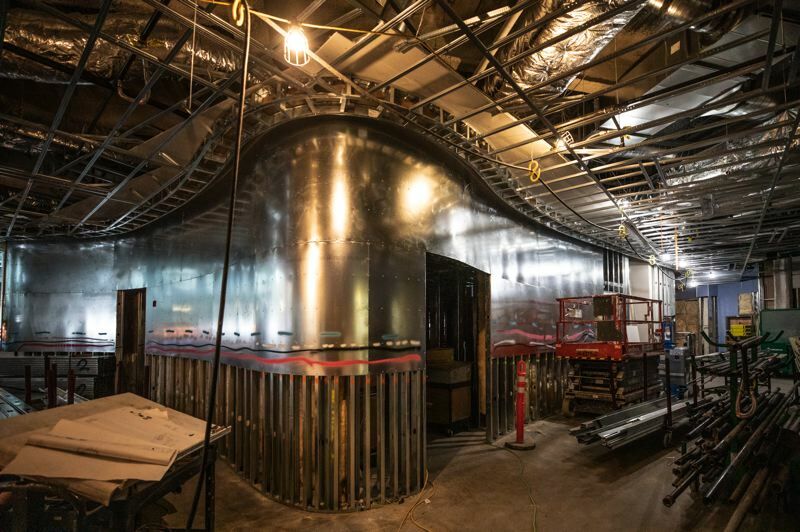 When it became apparent to Metro that the hotel was going to become a reality, the agency handed Wallace and her team two goals: bring in 5 to 10 new mid-sized conventions annually and increase the number of Oregon Convention Center-related annual room bookings by 16 to 32 percent. Wallace says those marks have already been exceeded. During the convention center's 2017-18 fiscal year, when Hyatt Regency rooms first became available for future bookings, 25 future convention groups booked 129,863 rooms. Five more new conventions were added from July to November during fiscal year 2018-19, adding future bookings for another 17,849 rooms. That's a total of 147,712 new room bookings for conventions to be held between 2020 and 2027. The meeting planners booking those rooms are citing their activity as tied directly to the Hyatt Regency's large room blocks and the hotel's proximity to the convention center, according to Wallace. "[In past years] we've had clients that have wanted to book Portland as their convention destination, but due to the lack of a large hotel adjacent to the convention center, they've decided to go to other cities," she said. "Now we have clients who have considered Portland in the past ... who book with us pretty much immediately. While Wallace can't say for sure whether the existence of the Hyatt Regency will help Portland rise to a higher tier among convention centers across the country, she sees the hotel as an asset when it comes to the facility being able to compete with other major metropolitan cities for convention business. "I think it's still a little too early to say that it will increase use with regard to our tier," Williams said. "[But] I think Portland has been a desirable convention destination for the last five years, and it definitely makes us more attractive."